WACO, Texas—Booneville (Miss.) 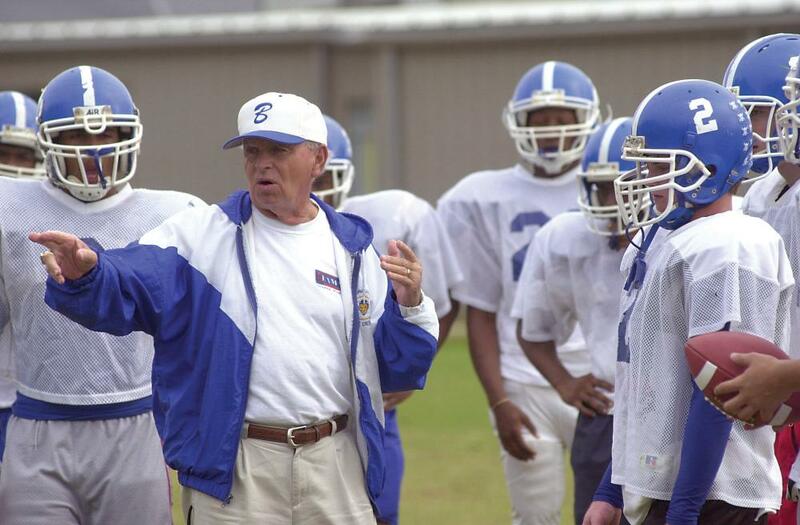 High School head coach Jim Drewry has been named the 2009 Power of Influence Award recipient. The Mississippi High School Activities Association nominated Drewry. The award, which is presented jointly by the American Football Coaches Association® and the American Football Coaches Foundation®, will be presented to Drewry at the AFCA Coach of the Year dinner on Tuesday, January 12, at the 2010 AFCA Convention in Orlando, Fla.
Drewry began his coaching career at Kossuth (Miss.) High School in the spring of 1958. He spent two years at Kossuth, then moved to Brandon (Miss.) High School as an assistant coach in 1960. After five years, Drewry took the head coaching job at Booneville (Miss.) High School in 1965, beginning his first stint at the high school. He led the Blue Devils to three bowl games and a Tombigbee Conference co-championship in 1977. After a second stint as head coach at Kossuth High School from 1979 to 1986, Drewry took retirement and was out of coaching for two years. Selling insurance wasn’t enough for him, so he got back into coaching as head coach at Tishomingo (Miss.) High School in 1989. After just one season, Drewry headed back to Booneville for the second time in 1990, guiding the Blue Devils to a Class 2A state title. Since returning to Booneville, Drewry has led the Blue Devils to three state championships (1990, 1999 and 2000), finished runnerup four other times and won three division championships. He has an overall record of 336-151-5, as of release date, making him the most successful public school football coach in Mississippi. In addition to receiving the 2009 Power of Influence Award, Drewry has been inducted into the National Federation of State High School Associations Hall of Fame and is a member of the Mississippi Association of Coaches Hall of Fame. He has numerous coach-of-the-year honors, including being named State 2A Coach of the Year in 1999 and 2000. Other finalists for this year’s award were: Buddy Anderson, Vestavia Hills High School (Vestavia Hills, Ala.); Stacy Luker, Sweet Water High School (Sweet Water, Ala.); Jamie Riggs, T.R. Miller High School (Brewton, Ala.); Ronnie Peacock, Rogers High School (Rogers, Ark. ); Michael Gimenez, Whitney High School (Rocklin, Calif.); Rich Yonker, Poudre High School (Fort Collins, Colo.); Don Dobrino, Mt. Olive High School (Mt Olive, Ill.); Russ Isaacs, R. Nelson Snider High School (Fort Wayne, Ind. ); Robert McCoy, Bedford Community High School (Bedford, Iowa); Dave Nelson, Blaine High School (Chanhassen, Minn.); Randy Vigen, Central Valley High School (Buxton, N.D.); Terry Dosch, Roncalli High School (Aberdeen, S.D. ); Tim Teykl, B.F. Terry High School (Rosenberg, Texas); Tom Ingles, Puyallup High School (Puyallup, Wash.); and Jerry Sinz, Edgar High School (Edgar, Wis.). Past Power of Influence Award winners include: Larry Dippel, Amarillo (Texas) High School (2002); John McKissick, Summerville (S.C.) High School (2003); Marcus Borden, East Brunswick (N.J.) High School (2004); Ron Stolski, Brainerd (Minn.) High School (2005); Sid Otton, Tumwater (Wash.) High School (2006); Rob Younger, Sweet Home (Ore.) High School (2007); and George Smith, St. Thomas Aquinas (Fla.) High School (2008).